I always thought I didn't care for Rhubarb Crisp...until I tried this recipe from a friend and it won me over. Granted, it does have a lot of sugar in it so that could be why I love it so much. But, considering I don't make it too often, it's a nice summer treat to have just when the rhubarb is ripe for picking. We grow our own rhubarb so we always have plenty of it to not only make Rhubarb Crisp but also a yummy apple/rhubarb sauce that my husband came up with. It is AMAZING! 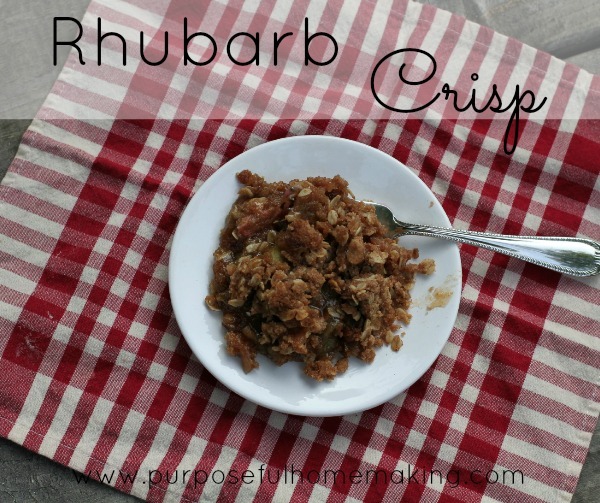 Here is our favorite Rhubarb Crisp recipe! Combine the above ingredients and pour into a 9x13 pan that has been sprayed with cooking oil. Combine and sprinkle over rhubarb mixture. Bake at 375 degrees for 35-40 minutes.